Three Coins in a Fountain. Roman Holiday. Eat Pray Love. In many of the greatest movies ever made, the biggest star was Italy itself. Where Did They Film That? Italy is a unique travel guide that invites the reader to explore the beauty and cultural riches of Italy through the universal language of cinema. Where Did They Film That? Italy shows readers where to find the exact locations where many of the most famous movies set in Italy were filmed — plus nearby attractions, museums, restaurants, shops, and must-experience slices of Italian life. The beautiful and historic sites immortalized in great films are the reader’s keys to experiencing the best in Italian travel, art, dining, and living. Special sections highlight romantic Italian sites that are perfect for scheduling weddings and other special events, and the book includes recipes for dishes from famous films and authentic Italian regional specialties. Where Did They Film That? Italy gives readers in-depth knowledge of the behind-the-scenes details of great films by placing their locations within the full context of their history and meaning to Italian culture. Guided by celebrated Italian popera star Romina Arena, readers will discover the real Italy as Italians know it. An irresistible combination of film history, travel guide, and the zest and seductiveness of la dolce vita, Where Did They Film That? 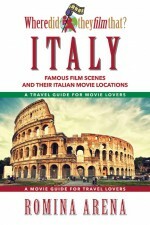 Italy is a new kind of travel guide that will turn Americans’ love of movies to a love of travel and new experiences. Audience: Travel readers, film history readers, and Italian culture readers. About the Author: Celebrated as “the Queen of Popera,” Romina Arena is an award-winning Italian international pop opera recording artist and songwriter who has performed before President Bill Clinton, Pope John Paul II, and many other world figures. Arena has sold over four million records worldwide and has received many major honors, including a Global Citizenship Award from the United Nations in recognition of her humanitarian support for the children of Haiti. Where Did They Film That? Italy is her first book. The best loved and most spectacular drive in California is documented in a beautifully illustrated artistic and literary journey. A fantastic drive comes to a stunning conclusion in An Artist and a Writer Travel Highway 1 South. Completing the trilogy started in An Artist and a Writer Travel Highway 1 North and continued in An Artist and a Writer Travel Highway 1 Central, An Artist and a Writer Travel Highway 1 South is an enchanting exploration of California’s State Highway 1 from Point Hueneme Lighthouse to the Mexican border. Lavishly illustrated with over 130 original full-color Pat Hunter watercolors depicting gorgeous landscapes and architectural treasures, An Artist and a Writer Travel Highway 1 South is a thinking person’s travel guide for people who want to explore the history, culture, and architecture of the Southern California Coast—as well as experiencing the best in dining, lodging, and unusual experiences along the route. 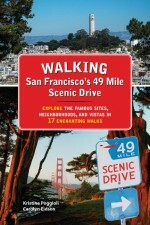 Going far beyond the usual travel guide, An Artist and a Writer Travel Highway 1 South is a literary and artistic collaboration that captures a very personal experience of a journey, illuminated by a deep cultural awareness of the places, people and history of California. 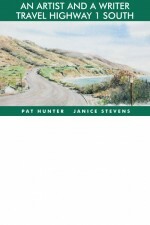 A personal memoir of the Hunter and Stevens’ personal journey along the great highway, An Artist and a Writer Travel Highway 1 South records the authors’ explorations off the beaten path, their serendipitous discoveries, and their personal reactions to the places they encounter. along the great highway, giving readers tips on the major points of interest, sights to see, places to stay and the best seafood restaurants on the coast. A satisfying and contemplative mixture of captivating artistry and personal essay, An Artist and a Writer Travel Highway 1 South is a triumphant conclusion to a unique travel trilogy. About the Authors: Pat Hunter is a widely recognized regional artist whose work has been shown in museums and galleries throughout California. 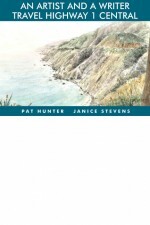 Janice Stevens is an author and teacher of English literature and creative writing. Hunter and Stevens have collaborated on numerous books on California architecture and history. The Pacific coast is the most iconic region of California and one of the most fascinating and rapidly changing places in the world. Densely populated, urbanized and industrialized — but also home to wilderness with complex, fragile ecosystems — the coast is the place where humanity and nature coexist in a precarious balance that is never perfectly stable. 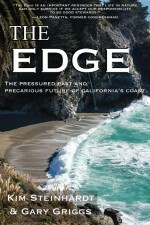 The Edge: The Pressured Past and Precarious Future of California’s Coast is a dramatic snapshot of the California coast’s past, present and probable future in a time of climate change and expanding human activity. Written by two marine experts who grew up on the coast, The Edge is both a celebration of the coast’s natural and cultural uniqueness and a warning of the many complex changes that threaten that uniqueness. As ocean levels rise, coastal communities are starting to erode, and entire neighborhoods have been lost to the sea. Coastal ecosystems and wildlife that were already stressed by human settlement now face new dangers, some threatening their very survival. The combined impacts of climate change, housing and commercial growth, commercial fisheries, oil drilling and production, along with environmental advocacy, all come together to define the future of the region. The Edge examines the current state of the coast’s natural and social environments, gives the historical causes for the coast’s present endangerment and offers informed projections on possible scenarios of the coast’s future. A masterful and sweeping synthesis of environmental and social science, The Edge presents a comprehensive portrait of natural and cultural history — the story of the people, communities, industries, ecology and wildlife of the California coast. Audience: Readers interested in environmental issues, marine wildlife, climate change and California history. About the Authors: A widely recognized marine wildlife photographer, former administrative law judge, and a long-time conservation advocate, Kim Steinhardt delivers popular lectures and photographic programs on coastal conservation and ocean stewardship issues for aquariums and marine centers, universities, state parks and other audiences. Gary Griggs has written or co-authored nine books about the coast and coastal issues both in California and globally. As a Distinguished Professor of Earth and Planetary Sciences at the University of California at Santa Cruz, he is known for his expertise in oceanography and coastal geology. He serves as the director of the Institute of Marine Sciences at UC Santa Cruz. Before it was a modern freeway, California’s State Highway 99 was the main street of California, a simple two-lane road that passed through the downtowns of every city between the Mexican border and the Oregon state line. Highway 99: A History of California’s Main Street turns back the clock to those days when a narrow ribbon of asphalt tied the state’s communities together, with classic roadside attractions and plenty of fun along the way. Illustrated throughout with historical photographs, Highway 99 documents the birth and development of the great highway, from its beginnings as a dream project by a handful of early motorcar enthusiasts to its 1920s incarnation as a narrow trail over the Grapevine to the modern superhighway of today. Along the way, Highway 99 chronicles an amazing amount of history: the invention of basic highway equipment such as the center stripe and the road sign; the great Dust Bowl migrations of the Okies; the origins of California landmarks like Griffith Park and Magic Mountain; and the network of beacon towers for airplanes that briefly paralleled the highway in the 1920s; and numerous other stories. Above all, the story of Highway 99 is the story of classic American roadside culture. 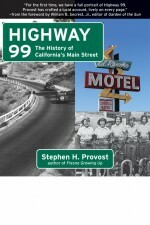 Highway 99 witnessed the birth of the motor court motel, the drive-thru window, the theme park, and the truck stop, and Highway 99 unearths detailed histories of the innumerable gas stations, hotel, restaurants, amusements, and whole communities that developed to cater to the motorist. From the foundations of America’s fast-food culture to the birth of the Bakersfield Sound, the history of California has happened around Highway 99, and Highway 99 brilliantly depicts that history. About the Author: Stephen H. Provost is a journalist, author, and editor of The Cambrian newspaper. His previous books include Fresno Growing Up: A City Comes of Age 1945—1985, a history of his hometown. Provost lives with his wife on California’s Central Coast, where he blogs at his website, stephenhprovost.com. Sacramento Bee journalist Sam McManis spent five years on the road trying to find the real California. He discovered that there is more than one California, but every different California is equally weird and wonderful. Worlds collide and commingle: the neo-hippies with the rednecked farmers; the urban sophisticates with the quirky desert dwellers; the Hollywood power brokers with the Outsider Artists. Brought together in a bouillabaisse of voices, Crossing California will make you see the state in an entirely new light. From the briny scent of Fisherman’s Wharf to the fragrant sage scrub of Imperial County; from the otherworldly starkness of Death Valley to the crashing waves and flexing muscles at Venice Beach, Crossing California gives readers a first-hand experience. McManis has stalked the tony aisles of the newly minted Broad Museum in gentrified downtown Los Angeles, and quick-footed it through the International Banana Museum along the desiccated shores of the moonscaped Salton Sea. He has inadvertently gotten his car stuck in a tree at a cheesy drive-thru giant Sequoia roadside attraction along the hemp highway between Mendocino and Humboldt, and witnessed, with both fascination and can’t-look-away horror, grown men and women, sans children and sans inhibitions, belt out full-throated versions of “Let It Go” at a Disneyland sing-along. All told, Crossing California is a trip. Audience: Readers interested in California culture, history, oddities, and humor. 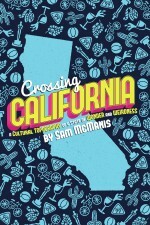 About the Author: Sam McManis is a former columnist and feature writer for the Sacramento Bee. He is a four-time winner of the Society of Features Journalism awards and three-time Best of the West honoree. He also has been a staff writer and editor at the San Francisco Chronicle and a sportswriter for the Los Angeles Times. His profiles and essays have appeared in the New York Times, Wall Street Journal and elsewhere. He lives and writes in Washington state. The sequel to the authors’ acclaimed book An Artist and a Writer Travel Highway 1 North, An Artist and a Writer Travel Highway 1 Central takes the reader on a unique literary and artistic journey through the natural and man-made beauty of California’s central coast. 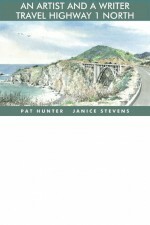 Lavishly illustrated with over 120 original full-color Pat Hunter watercolors depicting gorgeous landscapes and architectural treasures, An Artist and a Writer Travel Highway 1 Central is a thinking person’s travel guide that reveals hidden treasures and unexpected delights. Going far beyond the usual travel guide, An Artist and a Writer Travel Highway 1 Central is a literary and artistic collaboration that captures a very personal experience of a journey, illuminated by a deep historical awareness of the places, people and events of Highway 1 and the California coast. 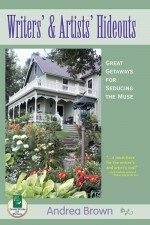 Perfect for keeping in the car or planning ahead at home, An Artist and a Writer Travel Highway 1 Central directs the reader to points of interest, sights to see and places to stay and the best seafood restaurants on the coast, giving readers everything they need to organize their own personal Highway 1 journeys. Long before Disneyland, there was San Francisco’s Playland at the Beach, a magical and glamorous amusement park that is still revered by San Franciscans more than 40 years after it closed. A beloved part of old San Francisco, Playland incorporated rides, dining, sightseeing, and socializing, and its pioneering rides and attractions inspired the designers of the amusement parks that followed. 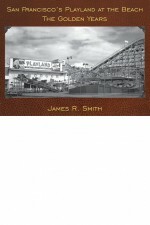 San Francisco historian James R. Smith completes his magisterial history of Playland in San Francisco’s Playland at the Beach: The Golden Years, the sequel to his stunning 2010 book San Francisco’s Playland at the Beach: The Early Years. While The Early Years told the story of the beginnings of Playland, The Golden Years covers the years 1940 to 1972, showcasing both the dazzling height of Playland’s postwar popularity and its decline, closure, and de struction during its final years. Together, the two volumes make a complete history of Playland and San Francisco recreation and leisure, as well as an amazing collection of beautiful and historic photographs — a wonderful companion set for any lover of old San Francisco. San Francisco’s Playland at the Beach: The Golden Years presents Playland as it is best remembered today — a playground where families experienced endless days of fun in San Francisco’s glorious postwar boom. Illustrated by a huge collection of rare black-and-white and color photographs, San Francisco’s Playland at the Beach: The Golden Years transports the reader back in time to experience the rides, attractions, restaurants, and behind-the-scenes operations of the great amusement park at the height of its glory. Comprehensively documented and illustrated, San Francisco’s Playland at the Beach: The Golden Years is the definitive and authoritative history of one of America’s landmark amusement parks. Unusual as they seem, underground buildings are surprisingly common. Every day, tens of thousands in North America work, shop, dine, study, and play in the more than three hundred public and commercial structures and five thousand private homes nestled in the earth. Underground buildings are safe, attractive, useful, and comfortable places to frequent and live. Unlike a common misconception, most are dry and warm, and they are often sun-filled. 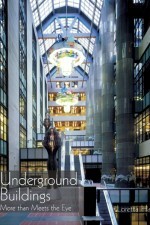 More than one hundred underground buildings are included in this fascinating subterranean tour. These buildings range from the famous to the unnoticed. Some were built for pragmatic reasons, others for aesthetic considerations, still others, for a combination of both. There are impressive success stories and discouraging tales of failure. Some underground buildings are incredibly energy-efficient, for example, while others leaked so badly they were abandoned.